GlamTech provides Dermatology-Grade Artificial Intelligence and Augmented Reality Technology Solutions to Skincare Brands, Retailers and Dermatologists, enabling them to provide their customers and patients with real-time skin analysis, skincare product recommendations, skincare product virtual try-on capabilities and skin performance tracking solutions. Provide your customers with DERMATOLOGY-GRADE DIGITAL SKIN DIAGNOSIS from the comfort of their homes using our Glamtech Skin Analysis Technology. GlamTech’s team of expert Dermatologists, Computer Vision and Machine Learning experts have labeled thousands of images identifying over 25 common skin disorders to ensure accurate digital skin analysis. 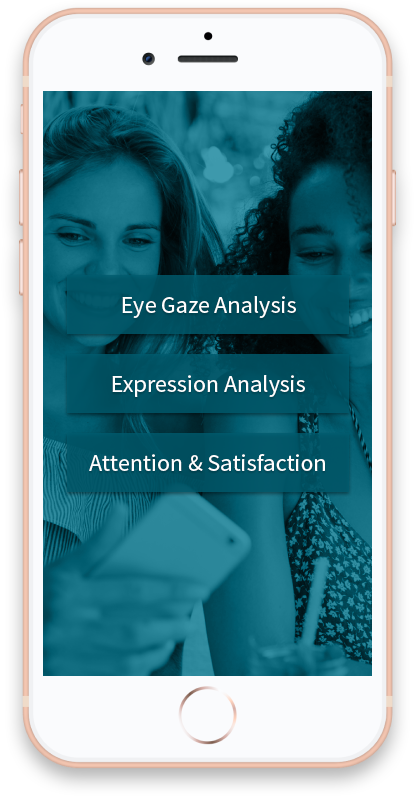 Try out our Skin Analysis technology to help you accurately identify your customers true skin problems in less than 30 SECONDS. STAND OUT FROM THE CROWD. Give your customers the power to “TRY BEFORE YOU BUY”. 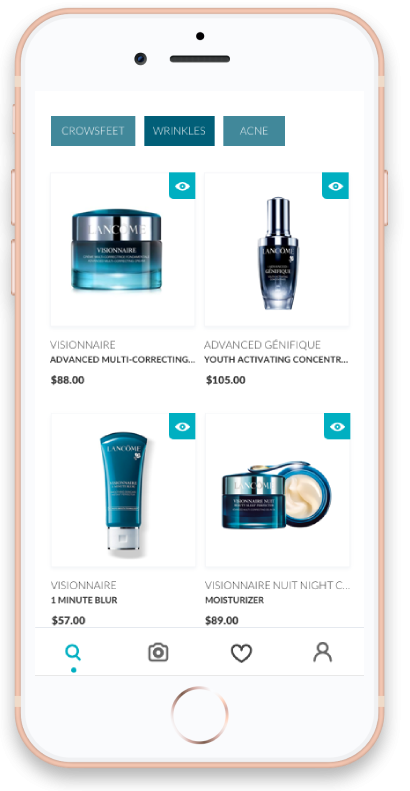 Show your customers the benefits of using your skincare products by integrating our Glamtech Virtual Try-On technology to your mobile and web applications. 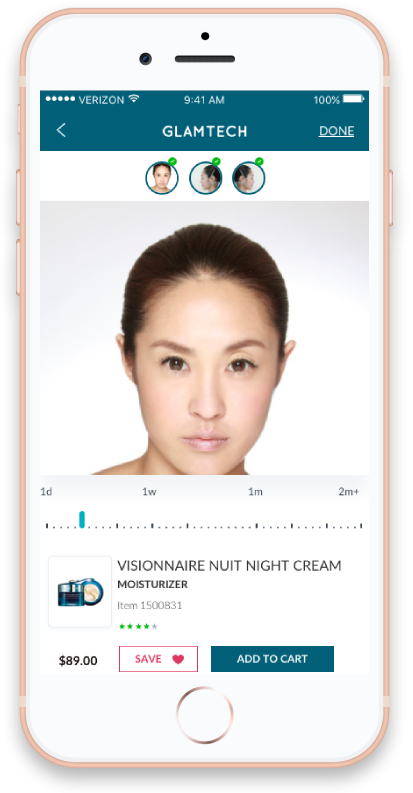 Glamtech Virtual Try-On combines the CLINICAL TRAIL RESULTS of your skincare products with our REAL-TIME AUGMENTED REALITY TECHNOLOGY to show your customers how their consistent usage of your products over a period of time would help improve their current skins condition. This would help INCREASE SALES & BRAND LOYALTY from your customers through their continued usage of your skincare products. GlamTech Skin Performance Tracking technology can be used to INCREASE CUSTOMER RETENTION RATE, PRODUCT SALES AND BRAND LOYALTY by enabling your customers to track their skins performance over time while using your products. 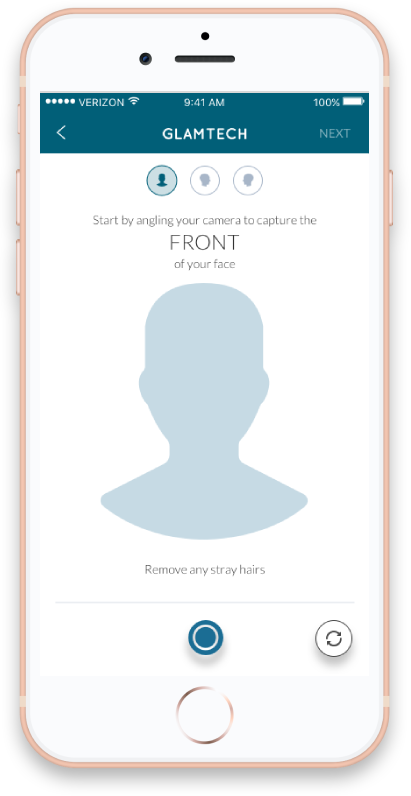 GlamTech’s Skin Performance Tracking technology enables your customers to set up a personalized schedule to take consistent photos to document and digitally track the improvement of their skin. 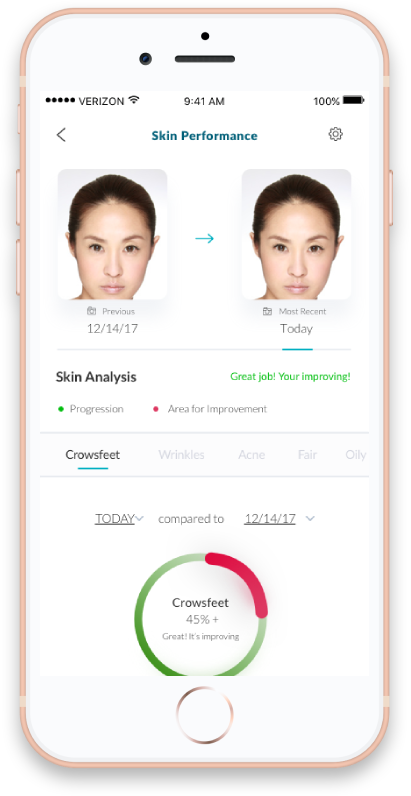 Customers can finally see the value of using your products regularly by tracking the TRUE INCREMENTAL PROGRESS in the appearance of their skin overtime. Use our GlamTech Product Recommendation technology to give your customers PERSONALIZED SKINCARE PRODUCT RECOMMENDATIONS to solve their individual skin issues. GlamTech uses Natural Language processing technology and linguistic information theory to extract insights from unstructured consumer product review data online to determine which skincare products have proven to provide the best results for customers specific skin concerns. Our expert Dermatologists also evaluate product ingredient listings to ensure the best products are recommended to your customers. Accurate skincare product recommendations help stir the customer in the direction TO PURCHASE THE RIGHT PRODUCTS TO HELP IMPROVE THEIR CURRENT SKIN PROBLEMS. GlamTech analyzes your customers skin data to understand the percentage of your users who have a specific skin problem. Your company can use this information to determine what products to target market to customers. GlamTech uses push notifications as a digital target marketing tool to send your customers periodic reminders about sales and promotions of the skincare recommended products that solve their specific skin problems.